A Sussex Cruicket League Premier Division side have signed a player touted as the ‘next Australian Test wicketkeeper’ as their overseas player for 2018. Cuckfield have secured the services of Sam Whiteman, an English-born wicket-keeper batsman touted as the next Australian Test keeper. Born in Yorkshire. Whiteman moved with family to Bunbury, Western Australia at the age of three and made his first-class debut early in the 2012/13 season. 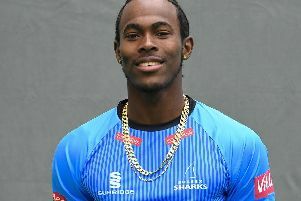 He has become a regular member of the Western Australia side and has won three Big Bash League titles with the Scorchers. The left-hander has already drawn comparisons to Adam Gilchrist and in a golden summer of 2013/14 he had BBL success with the Scorchers alongside 687 runs at 45.80 for Western Australia, placing him sixth on the Shield run tally, combined with 45 dismissals, the most of any keeper. He was subsequently named in the ‘Team of the Year’. His efforts earned him a call-up to the Australia A side for their four-day matches against India A in 2014 where he belted his maiden fast-class hundred, which formed part of a record 371-run stand with state teammate Mitchell Marsh. Whiteman finished on 174. Former Australian Test keeper Brad Haddin has publicly stated Whiteman has ‘all the characteristics’ of an international-calibre 'keeper. Complications from a serious finger has hampered his current 2017/18 season - he only returned to action for the Scorchers in January 2018 after a 12 month lay-off. In a view to getting himself back to 100%, he targeted a UK return to play league cricket in 2018 and Cuckfield have snapped him up. Whiteman follows current Test players Jeet Raval and Keshav Maharaj who have played at Cuckfield. Captain Josh Hayward said: ““I am very excited to be welcoming another great overseas player to the Cuckfield family this summer. Sam will be an incredible addition to our squad and to our coaching staff."